Many Christians in America today feel as if they are being persecuted as a class. Some even take what is happening personally. While I agree we are seeing the beginning stages of what may ultimately lead to full-blown persecution, it is nothing near what the early church, or many since, have experienced. The beheading of those who name the name of Christ in foreign countries is by all standards persecution. The lining up of students and asking their religion before shooting them is an isolated instance, not a full-scale persecution—although the ones involved in that horror would disagree. Persecution is a severe form of bullying. And, according to Jesus and the dictionary, until it begins to be a way of life for us in this country, we are NOT being persecuted. Jesus’ use of the pronoun “you” is in the plural, indicating the group—not specifically an individual. Let us not overlook, however, the individual application of this verse in our own lives, because it is possible for an individual to be persecuted for their faith. It can happen in school, on the job, in the family, or in your church. Jesus places a high standard for us to achieve when He says, “Rejoice, and be exceeding glad.” As we will see throughout this study of His little 17-minute ‘sermon,’ all His standards are impossibly high for a human. Each of His statements calls us to a higher plane than to give into a normal reaction as a civilized human being. Those who believe that “righteousness” means “right-doing” will have a different perspective on this than what Jesus said. They will rejoice when their actions have caused someone to be at odds with them. For instance, I know a woman who proclaimed that she was being persecuted for righteousness’ sake (her words), because her daughter would no longer talk to her. Her daughter cut the mother off because she insisted on “witnessing” every time they were in any kind of a conversation. But, right-doing is not necessarily the biblical meaning of righteousness. Jesus is our righteousness. When we are persecuted for “righteousness’ sake,” we are persecuted for His sake (Matt. 5:11). The persecution comes because of who we are in Him, not what we do because of Him. That may be a little difficult to comprehend due to our centuries-long indoctrination of right-doing; but it is of utmost importance that we understand this. Only then will we be able to understand and apply the meaning of Jesus’ command to rejoice and be exceeding glad. Why? Because if I am persecuted for something I do, then the focus is on me. I am the problem. If I am persecuted for who I am, then the focus is on the Truth—Jesus. There is also a seemingly subtle aspect that is completely overlooked in most teaching and understanding surrounding this idea of persecution—religiosity. 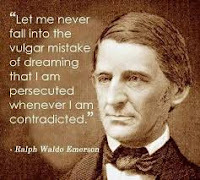 Who was it that persecuted the prophets? Who was it that persecuted Paul? Who was it that persecuted Jesus? Who was it that persecuted the Reformers? The devil, I believe, has us deceived yet again by making us focus on the persecution from the world while the organized institutional church continues to maintain its hold on the minds and hearts of God’s people, just as it did before the Reformation. Until we become a thorn in the side of the religious institutions and those leaders who do not follow the Word, we will not understand the true depth of the horrors of persecution.